If Remington were to hire me to be the Brand Manager for Marlin, I’d have a list of changes to make. First off, everyone that is charge of Quality Control that’s been there since 2007… Those guys are fired or demoted to push broom control. All the current executives since 2007 would all be fired as well. What they have done to the Marlin Brand is unforgivable. They brought out the X7 series of rifles. Cheap Bolt Action rifles, which on the surface is just fine. But this isn’t keeping in with the Marlin Brand; the Marlin Image. Marlin should be a recognizable brand like Jeep is. But the X7 is like Jeep building a cheap little Sports Car. Sure it’s rather interesting, but it’s not keeping with the Brand. That makes it wrong. I know a couple guys that quite like their X7 rifles. Bully for them. But I’d most likely kill the line. Marlin is owned by Remington and Remington already has cheap bolt actions, so there is no need come compete within the company family. Of course, Marlin’s not had to have a Recall on these that I am aware of or remember, so I don’t know for sure… I’d have to look at the numbers. What do know though, is that I hate the X7. The stock feels cheap and flimsy and I just hate it. I’d perhaps ask Hogue to make a strong OEM stock for it, or look at a Laminate Wood option. This will of course raise the cost – but it would be a huge improvement. So I’d either have other stocks or I’d kill the line. Simple as that on the X7. Done. 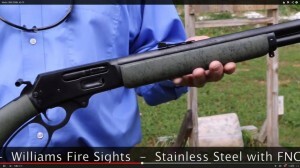 The XLR series of rifles… Marlin’s longer range lever guns. You can get them in .308MX, .338MX, or .30-30. There is a note on the web page that says it’s also coming (in 2007) in .35 Remington. But I’ve yet to see that. I’d also like to see a .45-70 and .444 Marlin versions as well. These need the 24/7 rail, like what comes on the 1895 SBL. This rail should be on the XLR’s since everyone who buys them puts a scope on them. The longer 24/7 scope rail would allow more and better scope options for the rifle. It only makes sense to include it. That brings us to the 1895 SBL. This is one of my favorite guns. The only problem is that it’s Stainless. Or I should say, that it’s ONLY in Stainless. There should be the option for one in Blue. Don’t you think? Since Marlin doesn’t make one, I made one. This was the 1895GBL. But the GBL doesn’t come with that 24/7 Rail like the SBL has. This is an oversight that. I’m not all about railing up all the guns – but this rail for the 1895’s just makes too much sense. You can then use what ever scope up want and mount it where you like. These SBL and GBL rifles should also be available in .444 Marlin and .35 Remington. Again, it only makes sense to offer these guns in more calibers. Not everyone wants .45-70. Marlin used to offer a 16″ version… And I shot one. This was my GBL with the 24/7 Rail. It was fantastic. I called it a “Guide Gun”, which is wrong… It had another name but I forget. But it was factory direct like that. That option needs to come back. I would like to see an even bigger version of the Guide Gun. In .50 Caliber. The best .50 round that could work is the .500 S&W Magnum. This would require some resizing of the action – Something you are not wanting to do, but it needs to be done. Slightly larger and a lot stronger. Every option in the 1895 line should be available here. Including SBL’s and GBL’s. The guns would chamber both the .500 S&W Magnum and the .460 Magnum. Right now people who want one bad enough are shelling out over 2400 bucks to have one custom made – This is money Marlin could be making. If some company no one ever heard of is doing this – Marlin could be doing it too. Excuses are too late. This is why I had all the prior execs fired. Don’t tell me it can’t be done. Do it. Just Fricken Make It Happen, you lazy, slackwits. People will buy it. Because for 9 years people were constantly asking for it. So what if it would costs 1400 bucks per rifle – People would buy it. This brings us to the 336 family. Again, the 24/7 Rail and Big Loop combo should be offered. There should also be a 16″ Barreled version. Before, there was a 16, in the 336Y model, which I can’t find anymore. The 20″ barrel is fine, but some people like them to be shorter. Basically I want the same options in the 1895 line as in the 336 line. .30-30, .308MX, .338MX, and .35 Remington should all have homes in all versions of the 336. The Cowboy series has 2 guns. One in .30-30, and one in .45-70. Where are the other calibers? And why is the .30-30 so short? Where’s the long barreled option? It needs to 26″. The .45-70 option is a bit disappointing. Where is the classic tang mounted aperture sight? The Cowboy Gun needs a stepped up version for the Cowboy Action competitions. Those guys take their shooting seriously and to attract them in greater numbers, let’s do a 30″ barreled version, with Brass buttplate and end caps. A “Quigley” variant, if you will. The 39A is a Classic. But it’s long and heavy and from spending 9 years behind a gun counter, selling these to young fathers for their young boys and girls… It’s a bit too heavy. Shortening the barrel down to 16 inches and offering it with a lighter weight synthetic stock as an option would really help that. So a light and short youth version is required. The 39Y. And since some guys like me like Carbines, a 39C, with a 16″ barrel. Now, let’s also offer a Stainless Steel version of the A and C guns, and call them simply the AS and CS. The 39 series also needs to have a Magnum version. Call it the 49 series, with all the options as in the 39. .22 Magnum and .17HMR. Don’t tell me it can’t be done. Henry, Winchester, and Browning made them. Henry still does. And let’s do a special edition 49 Cowboy. Because that would just be amazing. The 1894 line. First off… There needs to be the SBL version that was in the 2011 Catalog but never really made. It’s time to make it. Also, like as I said with the 336 line, the 1894 Line needs to have all calibers available in all versions. Where is the .45 Colt option? Over there in the Cowboy version. That’s it? What jackoff said that it can only be in the Cowboy? He better have his desk cleared off. .38/.357, .44 Mag/Special, .45 Colt/Casull. I want this, in blued steel and walnut. (Forgive my sloppy PhotoChop) Legacy, Rossi and Henry are doing Mare’s Legs. Where is Marlin’s? 12 to 13 inches. Also, as a factory option, offer the Mare’s Leg with a full sized rifle stock for the guys that want to turn them into a Short Barreled Rifle. Hell, we’d just throw the stock in the box with it. We’d have to come up with a different name… Bounty Hunter and Mare’s Leg are both taken. Maybe call it the “Outlaw”, or “Rustler”. And of course, make it available in all caliber options. Top it with that 24/7 Rail and a Red Dot, I’d call mine the Borderland Pistol, or the Jacob Pistol. Stainless and Grey or Blued and Laminate Brown Wood. The internals on all the Levers I’ve seen have been HIDEOUS. I’ve had to disassemble every Marlin I’ve ever owned and hand finished and polished the internals as best as I could. Every time. Why? This should be done on every gun before it leaves the factory. Reason? Because the Marlin name is on every rifle that leaves the factory. I’ve had gouges and burrs on Internal Operating parts. On the levers. Ive had bolt’s so rough I thought they were threaded. The inside areas of these 1895’s, 336’s, and 39’s have all been drastically unfinished. It’s as if you were digging the metal out like you were carving a canoe out of a log. It’s tragic. It’s a failure. It needs to be addressed. For the love of all that is holy – Can’t you jackwagon’s just deburr the inside of the loading ports? I’ve cut myself on them more than once. And where is a Centerfire Takedown Lever Action? Taylors and Wild West Guns can make them – Where’s Marlin’s Take Down? The 39A takes down… Come on now, let’s get with the program. What do you say Remington? Pay me 200 grand a year and give me a bull horn and a Chainsaw… I’ll have people lining up to buy Marlins. However, I’d like it with a blued barrel and magazine tube, stainless receiver, and walnut stocks. The peep sights from Wild West Guns in Alaska, and a Big Loop. Hmmm… Perhaps – also – maybe 336 version in .30-30 Win.